Hello, friends. I hope you are having a lovely Sunday. Here is a favorite scripture of mine, from Doctrine & Covenants 109:7 Full quote and context. I love reading, and seeking wisdom in good books. I love learning by studying the world around me, by studying the interactions between people, by studying patterns and art and the responses of others when I ask them questions. I love learning by faith, which I think means learning by doing. Because when you do something, you're acting in faith that what you've studied and learned (if anything!) will work out. Some things are best learned by doing them, by moving forward in faith. I love wisdom. 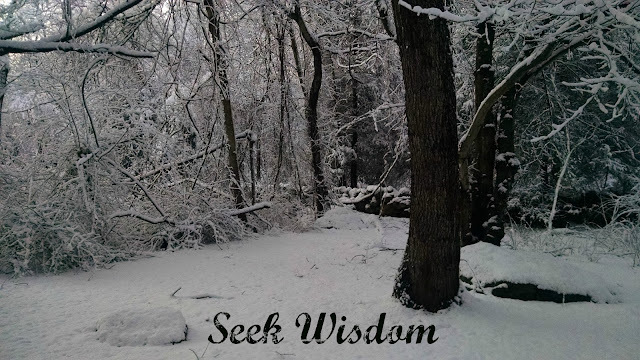 I've been fascinated by the concept of wisdom since I was a teen, and have read a lot about wisdom over the years. Wisdom is a special quality that's hard to define, but I think it encompasses knowledge and how to use it in good will for the best results. Wisdom is often personified as a woman in works of art, and thinking about the wise women in my life fills me with love. The wise and kind men in my life also bless me immeasurably. What books have you found that contain words of wisdom? Who are the wise people that have blessed you?